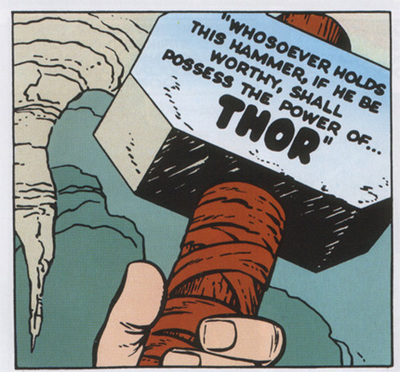 Thor's hammer (Mjolnir) in the comics has a special power. The hammer can only lifted by someone it deems worthy of holding it. There has been a lot of debate about what exactly worthy means and this has been discussed a lot in the comics. The first thing to note is that Thor is not the only person to lift the hammer. Over the comic history of Thor there have been numerous people, and aliens who have lifted his hammer. It is not a super common trait amongst people, but it does exist. As you can see this description includes nothing about the Hammer not rising except to those it deems worthy. The worthy inscription was something that was added by Marvel to Thor's origin as a hero. In the comics Odin sends Thor to Earth for his insolence. Thor is turned into a simple ordinary doctor a man by the name of Donald Blake. Blake does not retain the memories of being Thor. He works as a doctor and falls in love with Jane Foster. Thor lives as the doctor for 10 years before he decides to take a vacation in Norway. In a cave in Norway Blake discovers a stick that when struck turns into the Hammer of Thor and converts him into Thor. This stick was in fact Thor's hammer hidden and disguised by Odin and waiting for Thor to be "Worthy" of it. The lifting of Thor's hammer was a central part of legendary Thor scribe Walt Simonson's story about Beta Ray Bill lifting Thor's hammer. At a Thor Spotlight Panel at Baltimore Comic Con in 2010 Walt talked about the reason why Beta Ray Bill was able to lift the hammer. Beta Ray Bill was a monstrous looking character who was shown to be able to lift the hammer. One of the cool things about Thor was the enchantment around Mjolnir and the original inscription on it. So I thought, well that means someone else can pick up this hammer and get this power, if they're worthy! So since then, some other big characters, people's favorites, have picked up the hammer, Captain America, Superman, whoever. But at this point, no one had ever picked up the hammer. I liked the idea of Cap walking to the bathroom and seeing it, and grabbing and just tugging, not being able to. So this had to be someone new. This is the most powerful weapon of the Norse gods. This hammer is a killing weapon. It's used to kill Frost Giants and others. So, Superman couldn't pick it up, cause he's never going to kill anyone, and the hammer knows that. Captain America, he's too patriotic. He's too much a symbol of America to be chosen by this Norse artifact. So he couldn't get it. So I created Bill because he's noble, and he's designed to kill. He's got a great purpose as a warrior, and also the noble ability. That makes him "worthy" whatever that may be. As far as appearance, back then, comics were these self-contained stories. So for Bill, I had to do this in short form. This was a four-issue story, and that was my longest on my entire run on Thor. We had to take him, make him into a character that the Hammer would recognize. So I wanted for Bill, I wanted him to have a "monstrous" look as a visual, so that everyone would think he's a bad guy, and I got letters after the first issue that said "What on earth? Why is this monster picking up the hammer, what's wrong with you?" and I said "I got it!" So I basically started with a skull, and then I made him a bit like a horse, with the gap behind the teeth. But horses are beautiful creatures. So what I was aiming for is a sense of death, a sense of monster, underlined by beauty. His costume was the same so that the minute you see that image, when he strikes the stick and becomes "Beta Ray Thor" or whatever, you know: OK, that guy has the powers of Thor. So that's why Bill had the monstrous face, that's why that stuff was done the way it was done. 2) Nobility - The Hammer does not want to wielded by an evil or crazed person. It wants its user to be honest and try to do right with it. This purpose should not be petty or even nationalistic. 3) Fighting and Killing - The hammer wants to be used to its fullest, it does not want a pacifist. It wants someone who routinely fights and is willing to kill when necessary. Note that brute strength of any magnitude is not capable of lifting the hammer. Some scientists have posited that this could be accomplished by in the real world by a mechanism that matches the force being thrust against it, by adding mass. The mechanism that adds mass would then shut off when the hammer decided a user was worthy. All of the Avengers will attempt to lift the hammer. Captain America will manage to move it a smudge. It is also rumored that a surprise character at the end of the film will be shown using the hammer. This could mean that the character has the above traits, or that the MCU has different guidelines.